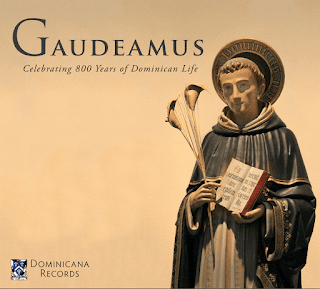 The Friars of the Dominican House of Studies in Washington DC have released a beautiful album entitled Gaudeamus: Celebrating 800 Years of Dominican Life. The recording is available here and includes Gregorian Chant and Polyphony as well as original compositions by some of the Friars themselves. This would make a lovely Christmas present and is an ideal means of supporting the Dominican House of Studies in DC. The full track listing is below, and the YouTube clip features an extract from Mark Nowakowski's O sacrum convivium. Further information is available here and here.